The City’s Office of Workforce Development is sponsoring a Health & Human Services Job Fair on Wednesday, April 1, from 11:00am-1:00pm at Central Square Library, 45 Pearl St., Cambridge. This will be a great opportunity for job seekers to connect with employers such as Cambridge Health Alliance, Crittenton Women’s Union, Harvard T.H. Chan School of Public Health, Perkins, Senior Whole Health, Spaulding Hospital/Cambridge, and many others. Those who plan to attend should remember to research companies and job opportunities before the job fair and to apply for appropriate positions online. For more information, contact Josh Foley at 617-349-6259 or jfoley@cambridgema.gov. How Would You Spend $500,000 to Improve Cambridge? If you’re a Cambridge resident age 12 or older, YOU can VOTE on how to spend $500,000 in FY16 Capital Funds to improve the community! In December 2014, the City of Cambridge launched the Participatory Budgeting (PB) initiative inviting community members to share ideas on projects to improve Cambridge. Participatory Budgeting is a democratic process through which community members directly decide how to spend part of a public budget. Cambridge’s pilot PB project will for the first time, directly involve residents in the budgeting and city-building process, foster civic engagement and community spirit, and help ensure that the city’s Capital Plan reflects the priorities of Cambridge residents. Each voter can select 5 projects on the ballot, regardless of the amount they add up to. The city will allocate $500,000 for the winning projects. Vote week begins with a kickoff event Sunday, March 22, from 2-4pm, at Cambridge Public Library, 449 Broadway. Residents will be able to talk with Budget Delegates and view project displays at two Project Expos on Tuesday, March 24, from 5:30-8:30pm, at Windsor Street Health Center, 119 Windsor St., and on Saturday, March 28, from 10am-2pm, during the Winter Farmers’ Market at Cambridge Community Center, 5 Callender St. Paper ballots at voting events will be available in English, Haitian Creole, Mandarin, Portuguese, and Spanish. Residents can also vote online, as long as they have a cell phone. Online voting will be text message authenticated. Voters will enter their cell phone number online and then will receive a code via text that must be entered for one-time access to the ballot. A link to the online ballot on the Participatory Budget webpage will be made available during the voting period March 22-28, 2015. The online ballot will be available in English and Spanish. For information on project proposals on the ballot and a full list of voting dates and locations, please visit www.cambridgema.gov/yourbudget. Four finalist teams will soon be presenting their visions for open space in Kendall Square and eastern Cambridge as part of the City’s Connect Kendall Square open space design competition. This project presents a unique opportunity to create a framework for the entire open space network in Kendall Square and eastern Cambridge. The competition attracted a wide range of planning and design firms, which were encouraged to consider new thinking regarding not only open space design, but also connections, programming, place making, and the overall public realm. The vision as well as the planning and design goals for the framework are the culmination of work by the Eastern Cambridge Kendall Square Open Space (ECKOS) Planning Committee, which began meeting in May 2013 and has worked closely with city staff and the community throughout the process. The four multidisciplinary teams selected as finalists are Somerville based Richard Burck Associates, Cambridge and Brooklyn based Michael Van Valkenburgh Associates, Inc., Seattle based Framework, and San Francisco based SITELAB. A public exhibition of the teams’ proposals is currently on display in the Google Connector lobby at 355 Main Street, Cambridge. The plans can also be viewed online at www.connectkendallsquare.com and www.cambridgema.gov/kendallopenspace. The finalist teams will present their framework plans to the Competition Jury March 25-26 at Cambridge City Hall Annex, 344 Broadway, 2nd floor meeting room. Presentations are open to the public and are scheduled as follows: Wednesday, March 25 (SITELAB Urban Studio 1:00-2:30pm; Michael Van Valkenburgh Associates, Inc. 3:00-4:30pm), and on Thursday, March 26 (Richard Burck Associates 8:30-10:00am; Framework Cultural Placemaking 10:30am-12:00pm). 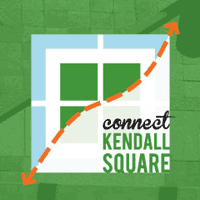 Over the past several decades, Kendall Square has transformed from a former industrial area into a world-renowned center of biotech, high tech research, and innovation. In the past few years, the City of Cambridge has acquired three parcels in the area, which will be part of more than 5 acres of new and redesigned public open space. The framework derived from this competition will help determine the character and role of the new public open spaces in the area (which will be designed as part of separate, subsequent processes), and guide private entities as to potential programming and design of both existing and future open space as part of private developments. For more information, contact Taha Jennings, Assistant to the City Manager, at 617-349-4302, tjennings@cambridgema.gov. Sidewalk Poetry is Coming to Cambridge! The City of Cambridge is pleased to announce the launch of a Sidewalk Poetry Program, designed to stamp poems written by Cambridge residents into freshly poured sidewalk locations throughout the City. 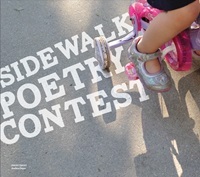 A collaboration of the Department of Public Works, Cambridge Arts, and the Cambridge Public Library, the Sidewalk Poetry Program will launch with a Poetry Contest to select several poems for 2015. The Cambridge Sidewalk Poetry Program was inspired by a similar ongoing program in St. Paul, Minnesota, begun in 2008 by artist Marcus Young as artist-in-residence in the St. Paul Department of Public Works. St. Paul has over 450 poems in St. Paul sidewalks to date. The Cambridge program will integrate poetry into its routine sidewalk repairs. The fresh concrete necessary when the City pours new sidewalk panels will provide an opportunity to stamp a poem in selected locations throughout the City. 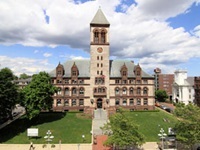 Mayor’s Office, Cambridge City Hall, 795 Massachusetts Ave. Step 1: Shop at a local business. Step 3: Take a picture of yourself visiting at least 1 business and tweet, Instagram or Facebook a picture using the hashtag #LovinCambMA. Please tag the business you are visiting, too! Raffle cards can be emailed, dropped off to the Mayor’s Office or City Hall Annex, or mailed in by Friday, April 3, 2015. More information and how to participate are available at: http://www.cambridgema.gov/lovinlocal. "The Lovin’ Local contest is a creative way for residents and area workers to come together and support our local, small business economy," said City Manager Richard C. Rossi. For more information on Lovin’ Local, go to www.cambridgema.gov/lovinlocal or contact Pardis Saffari at 617-349-4654 or psaffari@cambridgema.gov. Cambridge CityRun, a 5-Mile Road Race and Henrietta’s 3-Mile Fun Walk, is a popular rite of spring that attracts over 1,500 participants annually and was named one of the top 10 road races in New England for the 12th consecutive year by New England Runner magazine. Proceeds from the event will benefit Friends of Cambridge Athletics and The Andrea Harvey Memorial Fund. The first 1,000 pre-entrants will receive a free T-shirt. Entry Fee is $30 on or before March 21, $35 after. 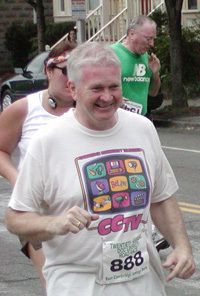 Register online at www.cambridgecityrun.com, in-person through March 21 at Marathon Sports, 1654 Mass. Ave., Cambridge. On the day of the event, register from 8:30-10am and race begins promptly at 10:30am. The scenic, flat, tree-lined course starts and finishes at the Russell Youth Center, 695 Huron Ave. From the start point, turn right on Grove St., right on Blanchard Rd., right on Concord Ave., right on Fresh Pond Parkway, right into Cambridge Water Department, then right onto Fresh Pond Reservoir Loop, right onto Fresh Pond Parkway, right onto Huron Ave.
For more information or to volunteer at event, contact Paul Ryder, 617-349- 6229 or pryder@cambridgema.gov. April is Fair Housing Month and the Cambridge Human Rights Commission is accepting nominations for its Innovations in Fair Housing Awards. Consider nominating individuals and/or groups who are working hard to continue Cambridge’s long history of fair housing and diversity. Individuals or groups should be Cambridge-based, involved in the promotion of fair housing, and have had a significant achievement within the last two years, with a focus on innovative work in support of fair housing. When submitting nominations, please tell us why you think this person or group deserves this award and provide a description of the work performed in Cambridge to promote Fair Housing. Selected nominees will be honored at the Fair Housing Month Awards Ceremony Tuesday, April 14, 5-7pm, at Cambridge City Hall, Sullivan Chamber, 795 Mass. Ave. Please send nominations via mail or email by March 30, 2015 at 8pm to: Nancy B. Schlacter, Fair Housing Project Coordinator, Cambridge Human Rights Commission, 51 Inman Street, 2nd floor, Cambridge, MA 02139; Email: nschlacter@cambridgema.gov. The City of Cambridge will be holding a free, walk-in informational session on affordable rental and homeownership programs Tuesday, March 24, 6-8pm, at the Central Square Branch Library, 45 Pearl St. Additional information sessions will be held in different locations. Housing personnel from the Community Development Department will be available to discuss the City’s affordable rental and homeownership programs. For more information, please contact us at 617-349-4622.